For my Methods in Neuroscience Research module, we were all tasked with making a mini-dissertation. This involved us getting into groups, making and analysing an experiment as a group, then writing it up. I thought I would show you a little bit of what we got up to in the last few weeks. So, as you can tell from the title, our experiment was using eye-tracking. Seeing as unless you’re a psychology student you probably won’t ever get to see one of these, I thought I would document it. 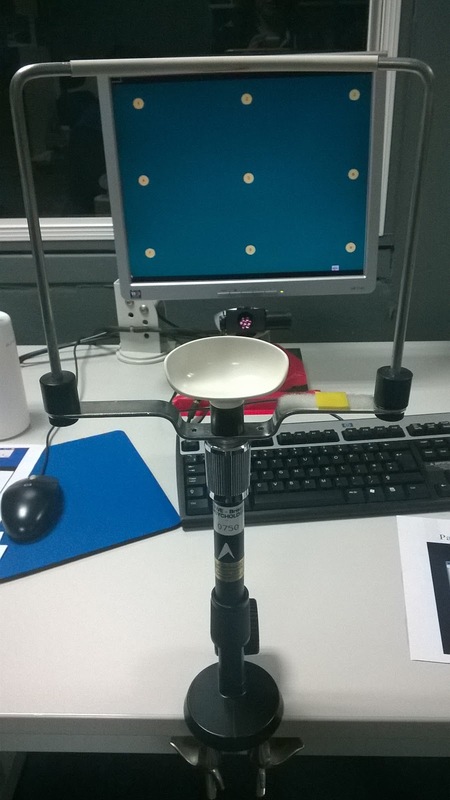 Firstly, here’s some pictures of the eye-tracking lab setup. On the left is the participant computer: the metal frame is for their head , and the plastic is for their chin. The computer is running software called GazeTracker, which can track people’s eye responses to pictures and even track their responses inside some software programs.This means it can also be used for user interface data. Below is the experimenter end of the setup. 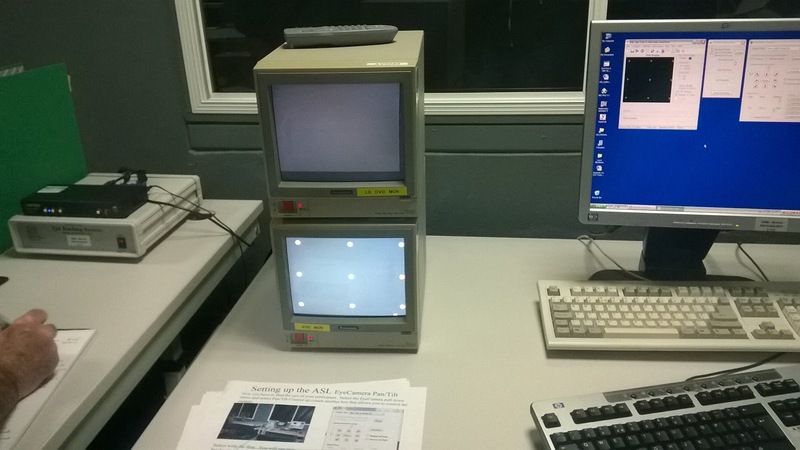 The experimenter computer is running EyeTrac software, which is used to control the camera and observe the eye. The two small monitors are secondary units attached to the experimenter computer. The bottom monitor mirrors the participants’ desktop, while the top monitor other shows the participants eye, and is used for getting an eye signal. The procedure for eye-tracking has a few steps, and the first is finding the eye with the camera. (This is why the metal frame is needed, to stop participants moving away and losing the signal).Our system only focuses on one eye, so people with one less-functioning eye, such as a lazy eye, or astigmatism, can still take part using their good eye. Once an eye has been found, it then needs to be focused. To do this, we needed to use the software’s lighting controls to illuminate the pupil, and a reflection from the cornea. The corneal reflection is technically what is being tracked, which is why it is often difficult to track people with contact lenses or glasses- however, its not impossible, as after a few hours of practice we could find a reflection on two people with glasses. 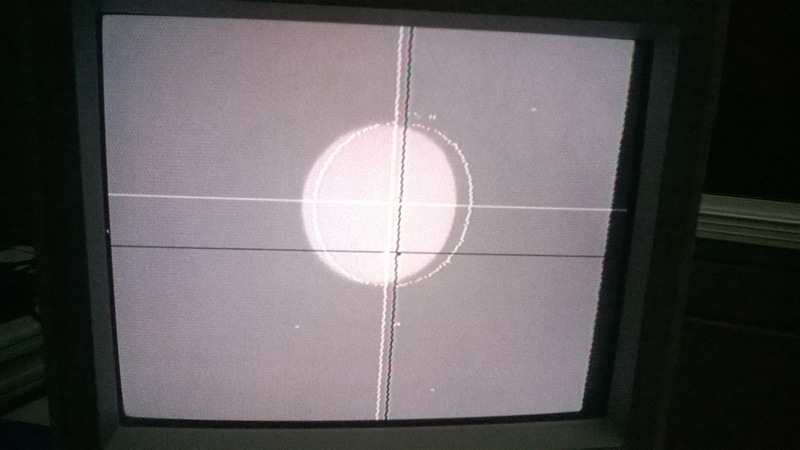 The secondary monitor tracks the pupil with a white crosshair, and the CR with a black crosshair, as shown below. Once both crosshairs are found and remain stable, the tracker needs to be calibrated. A calibration image (typically, a screen with coloured regularly-placed circles labelled 1-9 is used, but other images can be used depending on the experiment) is loaded onto the participants desktop. The points are then set on the experiment computer, by using the mouse to control another crosshair, and clicking on where the calibration points should be. Now the computer knows where the hoped-for calibration points are, the participant is then instructed to look at points 1 through 9 in turn. The experimenter needs to save the recorded position of their eye when they are looking at each point. Done properly, this means the entire available screen area is readable. However, with some people this process needs to be repeated multiple times in order to get a good calibration. The accuracy of the calibration can be tested by asking the participant to look back at some of the calibration points in a random order, and observing how close the crosshair marking their gaze is to the numbered point. I was the guinea pig for our groups calibration (our group is also known as MSJS, our initals, in the write-up), as I was the only person we could get a clear signal on, thanks to one member having glasses, one having a lazy eye, and one having contact lenses. This meant that I was very familiar with being a participant, but had to spend extra time at the end learning about how to actually perform the process myself. Now that calibration is finished, its time to go on to our experiment. We were investigating how line lengths affects people when reading text.. To do this, we had two tasks; a wordsearch where participants had to read until they found a specific word, and an information retrieval task where they would be asked a multiple-choice question then would read a slide that contained the answer in the text. We had two versions of each piece of text used, one at 60 characters per line, and one at 120 characters per line. Each participant had one of each task in each line length, and we were looking at whether they read the longer lines differently to the shorter ones. There has been research on this before, but the problem with most of the previous studies is that they were from the early 2000’s, when technologically things were quite a lot different- we were curious whether this would change the expected results. The results, and the other interesting information I found from this experiment, will be up in about three weeks time, after we’ve collected all the data and written it up. I learnt a lot about the process of making an experiment from the work we did as a group. The first thing we all learn was how to communicate with each other. One of the group was someone I’ve been friends with for years, so we almost always understand what each other is trying to say. The other two members were people I’d never spoken to before, and working so closely with unfamiliar people meant I had to learn how to explain my own thought processes and decisions a lot more clearly, in order to avoid us all misunderstanding each other. The second was how attached you can get to the smallest things: an hour-long debate was had over which way to counterbalance the two conditions to prevent order effects, and another over whether to have the multiple-choice questions before or after the text. Looking back, that seems so illogical, but at the time it was incredibly important- mistakes in designing even a small part of the experiment can easily affect what your results actually mean, or in some cases whether you even get any. Another good lesson from experiment design is that even when a particular way of doing things seems like the best method, you have to be able to look at it from other people’s point of view. In the words of writing teachers everywhere, you have to be able to “kill your darlings”- to prevent your own opinions clouding the best way to go about doing the experiment. Despite all the arguing, and a few technological hiccups on the way, we managed to get our experiment running, and currently have 8 of our 12 required participants. So its all systems go for our experiment.